Desensitisation is when anxiety is reduced by gradually getting used to the object or situation which causes fear. Basically, you’re exposed to things or situations which resemble the feared things or situations, and in a series of steps are guided towards the feared situation or object. This gradual approximation can work really well for lots of people! Desensitisation starts before any treatment is carried out. For example, it’s a good idea to gradually get used to the environment of the treatment room. Having your first appointment just for a chat, without actually sitting in the dental chair, helps with the desensitisation process. Gradually approaching the feared situation removes a lot of the fear factor, and ensures you’re never overwhelmed. How do dentists use desensitisation? One common way is the tell-show-do technique. Some dentists also know how to use systematic desensitisation (see below). Another way is through rehearsals (for example, rehearsing how to breathe with the rubber dam, or the cap on-off rehearsal when learning how to cope with an injection). Desensitisation, rehearsals and tell-show-do are highly interactive approaches which facilitate communication and rapport. The very fact that the dentist is taking time to explain things and acknowledge any anxieties or fears can make you feel more relaxed. Perhaps even more importantly, the fact that you can actively take part and (literally) get a feel for the equipment can make you feel in control and allow you to see things from the operator’s perspective. And, of course, it’s more fun! How do psychologists or therapists use desensitisation? Depending on what it is that you fear, psychologists or therapists can be highly inventive in suggesting ways in which you can used to the feared situation or object. Instead of having to expose yourself to the “real thing” straight away, they can work out a series of steps to guide you there, making sure that no step is too difficult or frightening for you to tackle. How can you use desensitisation yourself? There are many examples of desensitisation mentioned on this website. For example, if you’re terrified of having a dentist look at your teeth because you are terrified of what they’ll say, you can start off by letting them have a look outside the chair, without any mirror, in a not-too-bright place, just showing your front teeth. You may like to warn your dentist about the “shocking” sight they’re in for, not because they might actually be shocked, but because this provides them with the opportunity to reassure you! Once you’re confident that there won’t be any negative remarks, you can then proceed to actually open your mouth (again, with no touching and without a mirror). This can then be repeated in a brighter place, this time allowing some touching and perhaps a mirror, but still outside the chair. Once you’re happy that there won’t be a negative reaction, you can try out “the real thing” in the chair. You should be careful not to do anything which may reinforce or worsen your fears. For example, YouTube videos are not usually geared towards people with dental fears and the vast majority of them are best avoided! 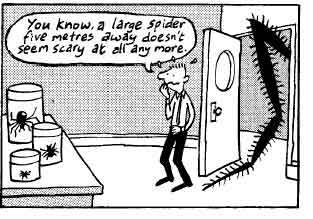 Systematic desensitisation means that you create a hierarchy (usually together with a therapist or dentist) of situations or objects that are similar to the feared situation or object, but not quite as frightening to you (e. g. looking at a drawing of a feared object rather than the actual object). You are taught relaxation techniques before you start. You then start off with the least frightening item in the hierarchy and use the relaxation techniques you’ve learnt, until you are confident that you can handle the least frightening item. Then you repeat this process which each item on the list, only moving on to the next more difficult item once you feel confident and relatively relaxed with the current one. As you can see, systematic desensitisation is a more structured approach – hence the “systematic”. You are shown the numbing gel (the least threatening stimulus). Some numbing gel is put onto your gums, so that you can try it. It is explained that this makes the tissue numb so that the needle can pass painlessly into it. You are shown and allowed to hold the cartridge that contains the local anesthetic solution, which looks like water. You then get an explanation how it works. You are shown the syringe and encouraged to hold it, and maybe figure out how to insert the cartridge. Once you are comfortable with this, you can have a look at the needle if you think you can manage. You can see how small the tip is, and you might be shown how easily it glides into things. A cap is put back onto the needle immediately afterwards. If you feel you are ready, the next big milestone is the “cap on” practice. Here, you practice the first step again (putting on the numbing gel), and then your dentist holds the needle (with the plastic cap on!) against your mucosa. This step is repeated quite a few times, until you feel fully comfortable. When you have built up enough trust and rapport to want to move on, the same thing is repeated with the “cap off” the needle. No injection is given. Once you are happy to take the final step, you can give consent to try a gentle injection. Obviously, numbing gel will have to be reapplied beforehand. The steps above are an example of desensitisation, and it may take anything from half an hour to three appointments to get to step 8. You may be asked to imagine you’re in a car looking at the speedo. The faster the speed, the more nervous you feel. Then you try to imagine lowering the speed and thus lowering your anxiety. Then, you and your dentist get an empty syringe with no needle on it. You move it towards your mouth, and you have to lower the “speed” as the two of you are doing it. This is repeated 5 or 6 times until you are completely relaxed. Then you “escalate”, the needle is attached but with the cap on, and the same is repeated until you’ve lowered the speed so that you feel completely relaxed. The same is repeated with the local anesthetic cartridge in the syringe, but with the needle still capped. Then, the cap is taken off the needle but the needle isn’t inserted. All this would take a dentist skilled with this technique about half an hour, although it does depend on the individual. The information on this page has been provided by Dental Fear Central. Needle Phobia Desensitisation Protocols by Mike Gow BDS and Gordon Laurie BDS, a specialist in special care dentistry. Last reviewed on December 2, 2018. We welcome your feedback on our information resources.